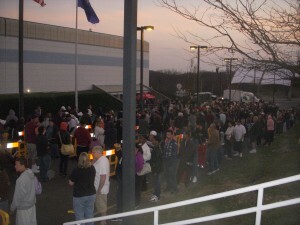 On Friday, March 23, 2012, a few minutes before 6:00 am, a round of applause broke out in the Western Connecticut State University Gymnasium. The reality of this sudden moment of praise had nothing to do with athletics, people were cheering for the first registered patient of the Mission of Mercy event as they entered the newly transformed dental clinic which was just your average basketball court the day before. Word had spread that the woman and her son had arrived the day before around 1pm to stand first in line for almost eighteen hours to receive the free dental care that the clinic was offering the following day. In past years, some patients had to be turned away before the clinic even opened; this year, hundreds of people started to arrive on Thursday and early on Friday with their blankets and chairs, trying to guarantee a seat in a dental chair. By 11:00 am on Friday, only five hours after patient number one walked through the doors, an announcement was made that four hundred and fifty patients had been checked out with over three-hundred thousand dollars worth of free dental care being completed. The HealthCorps members of CHC were among the estimated 1600 volunteers who participated from Thursday to Sunday helping with everything from the extensive Set-up, patient escorting, interpretation, registration, childcare, parking, and clean-up. Not to mention the hundreds of Dentists and Hygienists who donated their services with nothing but smiles for about 2000 patients. One person I talked to really appreciated the large number of volunteers, which gave patients the sense that people wanted them to feel as comfortable as possible while enduring some not so pleasant procedures. A good amount of patients seemed to be returners from previous years and new patients seemed amazed with the incredible organization and determination of the dental providers and assistants. Many Volunteer leaders had been returners and their enthusiasm throughout the first day was remarkable. 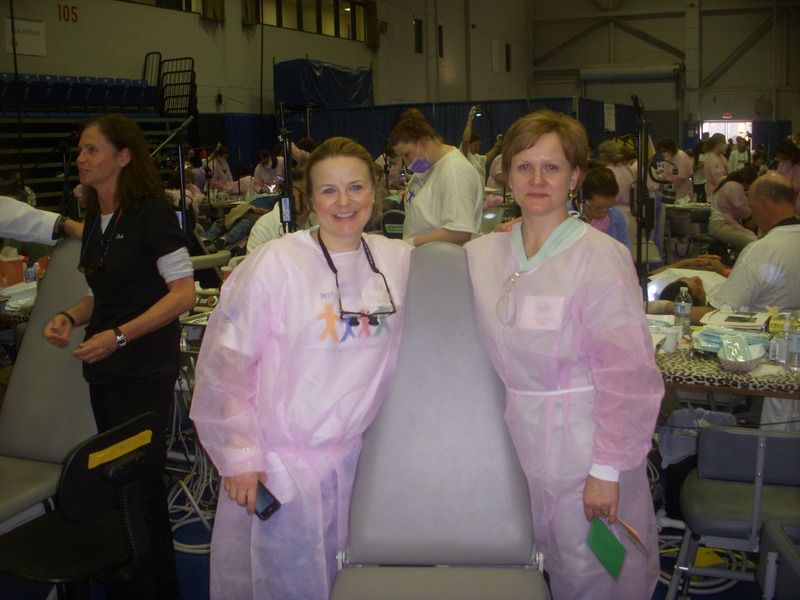 For the past five years, the Connecticut Mission of Mercy, generally referred to as CTMOM, has operated a two day dental clinic that offers free dental care to the underserved and uninsured people of the Constitution state. This being my first year at CTMOM, I had heard that we would not believe our eyes as the event got underway; it was truly an understatement. The first day was filled with many emotions overflowing with contact among patients and providers that were truly inspirational. It is hard to really explain how a gymnasium could operate as a fully functioning dental clinic that was conducting x-rays on one side of the room and extracting teeth just a few feet away. 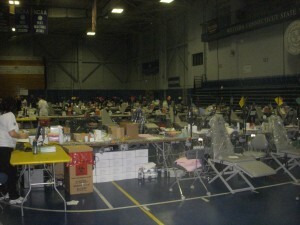 The foot traffic of volunteers, patients, and providers was overwhelming at some times, but people seemed to move throughout the gym with ease. Registration and check-out was equipped with computers and printers to ensure a quick in and out method. Rows upon rows of dental chairs were set up in order by stations. Cleanings, restorative procedures, sealants, surgical procedures, root canals, moldings and repairs for dentures were among the areas where patients were directed. There were areas reserved for sanitizing instruments and the dental supplies headquarters. Along with a private section for children to receive their dental care, there was also an upstairs location with childcare for parents to drop off their kids so they could have time to see a dentist. In theory, someone would think that with the incredibly large number of patients waiting to be seen, it would be almost impossible to keep things flowing smoothly; for the most part, everything seemed to be working efficiently with the help of everyone eager to lend a hand when needed. Among the group of AmeriCorps members that were in attendance, the general consensus was that the event was truly an organizational achievement. Everything was so well thought out from patient care to volunteer care. 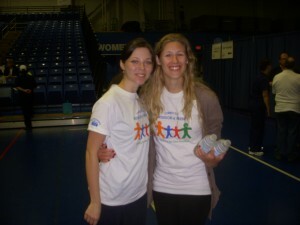 Volunteers were fed breakfast and lunch along with a rest area right off the gym that was equipped with two on hand massage therapists. We could go on and on talking about how well everything was put together but the real story we became to realize more and more, was how astonished we all were with the personal stories of people who have come to rely on free dental clinics, such as CTMOM, as their primary form of dental care. According to health experts, between six-hundred thousand to one million people in CT live without dental insurance. Even if people do have some type of dental coverage, they are usually restricted to proper care due to limited coverage. 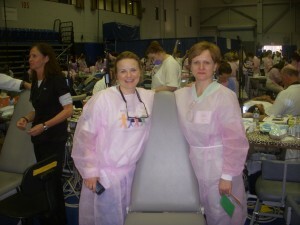 For some people, places similar to CT Mission of Mercy are their only option to receive any form of dental treatment. Although the final numbers are not yet available, the 2012 totals of CTMOM are about two thousand patients seen with over $1.2 million in dental work in two days. The people that traveled to Western Connecticut State University for dental care were above and beyond grateful. Every time you turned around, someone else was thanking you. At some point, I felt as if I was not worthy of the abundance of “thank-yous” we were receiving, it was the dental teams donating their time who deserved them; the problem was they were thanking us too. No matter how small someone’s job was, every single person who donated their time in one way or another was thanked on multiple occasions. It was one of those days where you felt like you were a part of something that was changing lives and it was an astonishing feeling that seemed to be contagious.